“Tell me about walnuts,” I ask Herr and Frau L. two doors down from me in Schmöckwitz: Herr L. dictates the ingredients of his homemade muesli into my dictaphone and finds a recipe book from 1916 with dishes using ground walnuts instead of flour. Out of their window, the glorious meeting of three lakes is celebrated by a burst of white sails from the sailing school next door. Frau L. digs out her collection of tried-and-tested recipes, stuffed with revisions, alternatives, new ideas and recommendations, and finds one called “Gentleman’s Tart”(Herrentorte). Later that day, I hear of another version with nine eggs, as I sit around a table with Herr and Frau A., in their cosy wood-clad conservatory, over wine and fresh peeled walnuts. The bitter skin is removed – fiddly – but the reward is a moist, sappy taste which is lost when they are dried. Herr A.’s grandfather planted a pair of walnut trees on the family land at the end of the 1920s and afterwards hung a sign on the front of the house: “Plant a tree and you cannot fathom who will one day dance in the shade of its branches. Think! Your ancestors once planted for you.” A decade later, at the end of the 1930s, the family was able to enjoy the first walnut harvest. Drive southeast to the end of Adlergestell, Berlin’s longest road, and you come to Schmöckwitz. You will see a village green encircled by tramlines and gray-brown pebbledash cottages, a couple of run-down 1920s villas with finely twirling wrought-iron fences and saplings growing through their windowframes. You’ll see a pair of elegant townhouses – one burnt out the other still intact – a supermarket and empty shop-fronts. Then you’ll have to turn around, because this really is the end of the road. What you won’t see, is that you’ve driven onto a beautiful little island. Behind the ring of houses lie gardens leading down to the water. Tended by generations of safe, knowledgeable hands, they’re home to a myriad of trees, fruit orchards and vegetable patches cared for in the same way down the years, regardless of what was happening in the nearby capital. 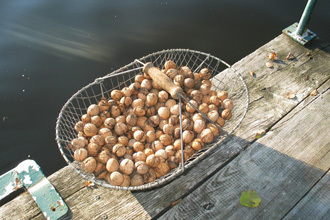 In almost every garden stands a walnut tree, its precious harvest gathered, dried and stored up for a birthday Torte, or the traditional Bunte Teller at Christmas, in hungry times and good times, cracked open and savoured by young and old, washed down with coffee, beer or wine, crumbled over muesli as an everyday habit, part of the island as much as the waters around it. The walnut is now seen as an important tree, protected under German law, but not everyone wants one. The leaves don’t compost easily and the walnut won’t abide other trees or plants in its vicinity, thanks to a substance called Juglone. Interestingly, the origins of Schmöckwitz’s walnut abundance may lie in Prussia’s militarist past. It’s said Frederick the Great, needing weapons, ordered that every farm in Prussia plant a walnut tree. The nuts belonged to the farmer, but the wood was for Prussian gunstocks. 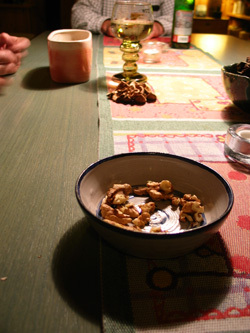 These days, whatever its origins, the walnut has grown roots in the culture and traditions of Central Europe. Local folklore and proverbs surrounding the walnut note its appearance is unpromising and to get inside is difficult. The nature of the shell is clear. What lies inside is an unknown, and Germans don’t like unknowns. In the Erzgebirge region of Germany, famous for its intricate wooden Christmas decorations, craftsmen fashion enchanting miniature worlds inside walnut shells, to be revealed on opening. I like this image. It says a lot about the German character – it’s difficult to get inside… but if you do, you’ll discover a hidden world. Frau L. offers to bake me a Herrentorte on her return from a dentist’s appointment out of town. I thank her for her recipe and give her a jar of my courgette chutney in return. Stir the ingredients together, pour the mixture into a cake form and bake it at a medium heat until it’s ready. Let it cool. Add a layer of butter/chocolate cream and 2 jars of morello cherries. Finally pour over cake glaze. Fine chop the walnuts. Stir the egg yolks for 30 minutes with the sugar. Add the nuts and the beaten egg whites. Bake the mixture in the porcelain dish in the oven for 15 minutes. Serve immediately.